Mama Monday: Will you still trust Me even when I don’t answer your prayer? This is not an easy post to write. It is not easy to say goodbye to beautiful Hope. And if you knew her, if you prayed for her, if you have had a glimpse of the Koslowski family than you know why. How do you express your gratitude to a family, to a baby, who has changed your life? As I sat in a filled church in Calgary on Saturday, I wept. I wept for Amy and Shawn. I wept for Hope. I wept wishing they had more time as a family. I wept because we will never see Hope run or eat her first ice cream cone. I had moments of complete sadness this week thinking about this incredibly gracious family. Who, through these last thirteen months have fought to keep their little girl alive while worshiping and sharing their faithfulness with others. I also had the privilege to stand in that church, surrounding the Koslowskis with worship and prayer. It was a time of reflection of celebration and an overall message of salvation. There is a book being complied of stories from many people that Hope touched. Stories of people becoming Christians simply from witnessing Amy and Shawn through all these months with Hope. Wonderful stories of people turning back to the Lord after an absence of Him. Messages of a newly, prayer-filled life. Parents changing the way they interact with their children because of Amy’s and Shawn profound impact. It was truly incredible. Hope truly was captivating. In meeting her my life will forever be changed. This little girl looked serious but it seemed that it was from her will to fight and continue on. She was engaging and as I would sing to her she would study my face. The books I showed her proved interesting, she took the time to look at the colors and the pictures, occasionally reaching out to touch the hard pages. Her eyes were so blue and bright. She was small and light to carry and I was nervous because of all the lines she was connected to. But she seemed to take me in stride, generally babies know you are nervous and therefore cry and don’t really want to be touched. But Hope was gracious. I am sure she sensed my nervousness but she allowed me to pick up her sweet body and give her cuddles. She was so kind. That may seem premature when talking about a baby, but she had this sense about her, this calmness. Before leaving for the hospital I been nervous and had been praying for God to walk with me into the ICE room. As I had just lost baby Faith a few months prior I was not sure how it would be to spend time with a baby when I was still in pain. Hope had such a way of comforting me. As I watched her fall asleep and was able to rub her side and she drifted off, I felt such peace. Hope reminded me that not only was I ok but that life is not just for getting things we want but that it is about loving others, comforting them. Just as she did for me. Seeing Hope continue to fight inspired me to continue going, to continue to hope and to put my trust in the Lord. As I continued to read Amy’s blog my focus shifted to intense prayer for this little girl. And for this family. I am not certain if I have ever prayed that faithfully for anyone before. My relationship with Lord deepened and I have Hope, Amy and the Lord to thank for that. Amy impacted my life in a fierce way. Not only was she welcoming and open to sharing her daughter with perfect strangers for cuddles. But she shared every facet of her feelings on Hope’s blog. Every word written on that blog was truth, raw, honest truth. Amy never pretended something was when it wasn’t. If she had a bad day she shared that and would simply ask for prayer. As she was enduring so much she would share her guilt over people taking care of her and that she could not give back be a better friend as much as she wanted to. I remember sending a package to Sadie for Valentines and Amy still found the time to write a thank you note. Honestly, she is as incredible as she sounds. As we worshipped on Saturday and we sang the words, “He gives and takes away.” I could barely lift my hands because I was overcome with the powerful nature of those words. They are hard words to sing. Especially when you think of beautiful Hope. 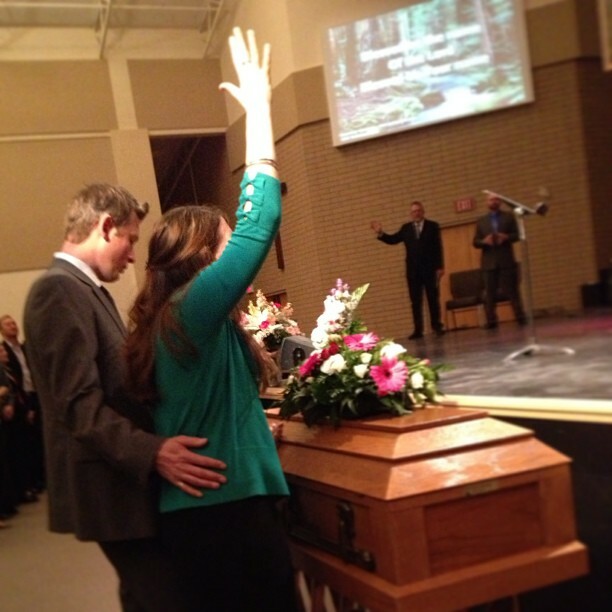 Within seconds of the words appearing on the screen, Amy moves up, places a hand on her baby’s casket and the other as high as she could and worshipped and sang those words. I have never seen such an act of faithfulness. With Shawn by her side she worshipped our Lord. I will forever be changed from that moment. If you want to share in celebrating Hope, if you want to be changed and hear an incredible message on faithfulness. Hope is still impacting lives as I write this there has been over 5500 views of her celebration on the weekend, this girl is unstoppable. Please share and visit this link http://new.livestream.com/FoothillsAllianceChurch/events/2125437 to watch Hope’s celebration of life. There has also been a fund started to send this wonderful family on vacation. 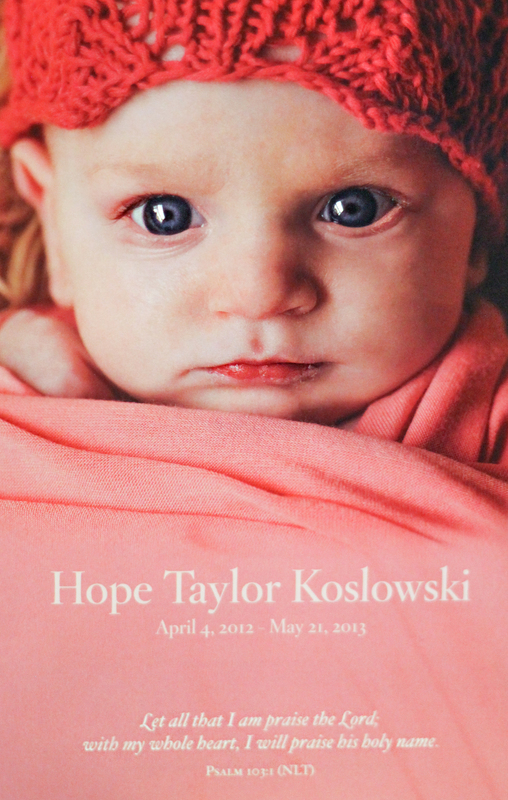 Click here to donate and read all about it http://www.gofundme.com/hopekoslowski. We so love you baby girl. Until we meet again Miss Hope…. This precious family knows that the Lord gives and takes away, and loves still. My heart goes out to them, and also rejoices with them at their deep love for Jesus, and that they’ll meet their baby again.